The aim of this week was to consolidate the training from week 5 by continuing to expose the dogs to new and varied environments both inside and out which replicate the type of areas they will be searching at fire scenes in Malaysia, such as darkened areas and stairwells. We also made the scent source more challenging by putting scent placements in challenging areas, such as on stairs, and above the height of the dogs head which gave the dogs a challenge in working the scent to source. For the sake of a fire investigation it is important for the dogs to track any scent of an accelerant directly to source in order for a successful forensic process to take place, that’s why during training each indication from the dog must be within a few centimetres of the source. 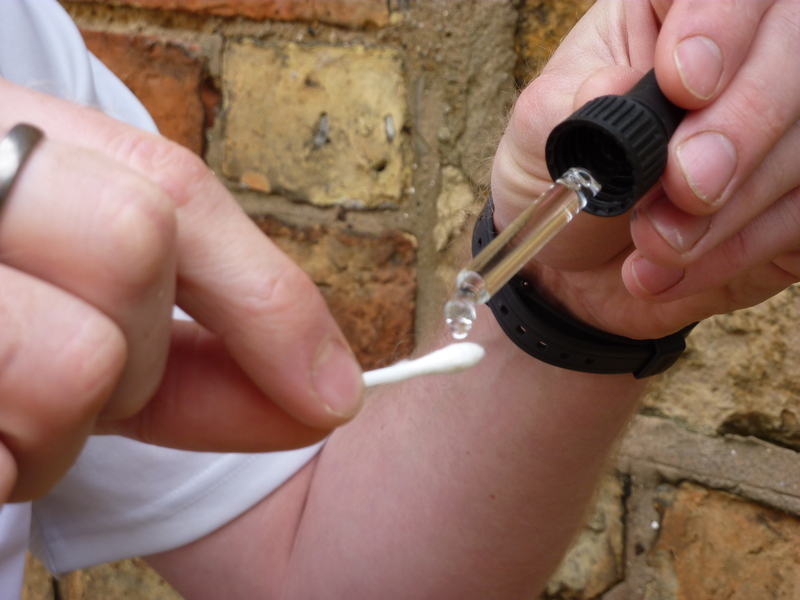 The picture shows just a few drops of petrol being placed onto a cotton bud which is then placed at a location where we want the dogs to be able to give a positive indication. Just a further point to note, the dogs are worked on a long lead as this is protocol for fire investigation dog handlers in Malaysia which is the dogs destination on completion of training. The video clip below shows Geoffrey, our Cocker Spaniel, doing a great job of tracking the scent to source. This particular training scenario was set up for the dogs to indicate above the height of their head.